Welcome to Freddie Bear Sports! Freddie Bear Sports is a full-line outdoor store located in Tinley Park, Illinois. We are an independently owned and operated business that has been serving customers for over 35 years. Freddie Bear Sports specializes in guns and gun supplies for hunting, concealed carry, home defense and police and security duty weapons. We have gun supplies including ammo, magazines, holsters, sights, and all cleaning supplies. Have a gun problem? We have a gunsmith to help. We also have a complete archery pro shop and an indoor archery range. We carry hunting supplies from all the top name brands. We also buy most major brands of guns. We buy new and used guns and gun collections of all types including antique and military pistols and rifles. In addition we buy and sell knives, swords, revolution, civil war, WWI, WWII, Japanese, German, Vietnam era relics. Freddie Bear Sports is open seven days a week for your convenience. Our online store is back! *Card-not-present sales for firearms cannot be sent direct to a cardholder; firearms MUST be shipped to and picked up from an authorized firearms dealer within the cardholder's geographical location. We are constantly adding new, used, rare, and collectible guns to our auction list. Click here to see what's new today! Now you can search our in-store gun inventory online! You can search by manufacturer, category, model series, finish, caliber even price range. We may also have something not yet posted so please give us a call if you're looking for something special. We can handle your custom orders. Freddie Bear Sports needs your used guns! We pay top dollar for used guns. Call Fred at our retail store at 708-532-4133 or email us to schedule a buying appointment. ILLINOIS CONCEALED CARRY CLASSES ARE NOW HERE! Freddie Bear Sports now offers pistol training! Day or evening classes at your location or ours. We also do private or group instruction. Give is a call at 708-532-4133 or email us for more information. Freddie Bear Sports now offers special pricing on Glock Pistols to law enforcement, first responders, correction officers, state licensed security officers, active/retired military personnel and GSSF Members! Come in and show your ID for special pricing. Eligible customers can purchase no more than 2 Glocks per year at Blue Label Pricing. This Spring we guide 5 different hunts for an Eastern Wild Turkey. We hunt private land in Brown, Adams and Fulton counties. Details Online or call 708-532-4133. Turkey Gallery: Check out our Turkey gallery, turkey hunting Tips and a list of the equipment you need to turkey hunt. >Our New Showcase Section includes some of the industries newest products along with hand picked products by Fred Lutger and Robert Hoague for every hunting season. Click here to see. We have it in our retail store or can get it for you, at the best price too. We add new products everyday, but if you don't see what you are looking for, we probably do sell it. Call our retail store at 708-532-4133 or email us for a quote and availability. 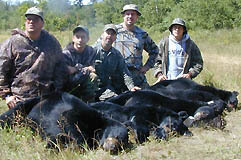 Next Fall we will guide 2 different hunts for a Canadian Black Bear hunt. 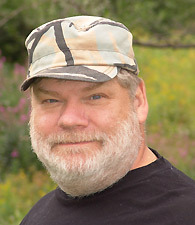 We hunt In Ontario, Canada near Atakokan, 90 miles from International Falls. Bring your fishing gear for super Walleye & Northern Pike fishing. Email for current details or call 708-532-4133.